Jason Mittell, left, and Christian Keathley, both faculty members of the Film & Media Culture department, will lead a two-week workshop on videographic criticism in June 2015. MIDDLEBURY, Vt. -- Two Middlebury faculty members will push the digital scholarship frontier when they host a two-week workshop titled “Scholarship in Sound & Image” in June 2015. 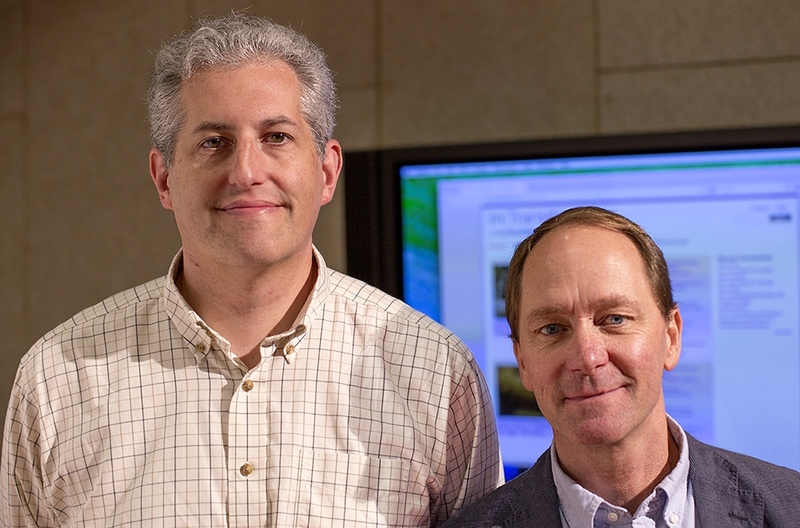 Christian Keathley, associate professor of film and media culture and Jason Mittell, professor of film and media culture, received funding from the National Endowment for the Humanities for the workshop, which will focus on videographic criticism. Aimed at scholars in film and media studies or related fields, the workshop will teach participants how to conceive and produce videographic criticism via digital sound and moving images. "50 Years On," a videographic essay by Christian Keathley for the Society of Cinema and Media Studies' 50th anniversary conference. Read more about this work. Videographic criticism typically appears in the form of short videos that range from less than a minute to 20 minutes or more, sometimes narrated by the researcher, with images and sounds from the films being examined. In most cases, the images and sounds are reworked and manipulated in ways that reveal some critical insight about them. Keathley is a founding editor of the new online film criticism journal, [in]Transition. Mittell is the journal’s project manager for MediaCommons, which co-founded [in]Transition with the Society for Cinema and Media Studies. [in]Transition is the first peer-reviewed academic journal of videographic film and moving image studies. In the fall of 2015, Keathley and Mittell will co-edit a special issue of the journal featuring videos produced by participants in the Middlebury workshop. New forms of digital scholarship have taken root throughout Middlebury and more are on the way as part of a campuswide Digital Liberal Arts Initiative, for which Mittell is a faculty co-director. Middlebury received an $800,000 grant from the Andrew W. Mellon Foundation earlier this year to train and support faculty on implementing digital projects in their teaching and scholarship. The grant will also provide opportunities for students and faculty to develop new collaborative research models and course content. The Scholarship in Sound & Image workshop will run from June 14-27, 2015 on the Middlebury College campus. For more information, visit the workshop website.